A group with good commercial success in very limited recording opportunities in rock after all of them had gone years without stepping into a studio following solid jazz careers, making them among the more unusual acts to feature prominently in rock’s early days. 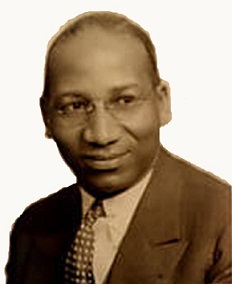 Edgar Hayes was born in Kentucky in 1902, got a degree in music from Wilberforce College and began his professional career in 1922 as a pianist around Ohio, backing others as well as starting his own group. He rose to some level of prominence in the 1930’s when he joined the Mills Blue Rhythm Band, playing and arranging for the group for six fairly productive years. Upon leaving them he began his own group and released a very notable two-sided record, a hit version of the standard “Stardust” and the original recording of the soon-to-be standard “In The Mood” for Decca. Though his star was rising his opportunities were not as his band broke up at the onset of World War Two and recording bans lasting much of the decade further hampered his ability to get more widespread recognition. As a result Hayes settled in California, assembling a four man unit he called The Stardusters featuring other jazz musicians fallen on hard times including guitarist Teddy Bunn and rounded out by bassist Curtis Counce and drummer Bryant Allen. During the next few years they apparently either moved away from the jazz repertoire, or merely expanded their material to take into account the transitional styles of the day in the black music scene and when, in late 1948, they were granted their first – and only – recording session for Exclusive Records of Los Angeles, their output fell mostly in rock ‘n’ roll, albeit with some jazz aesthetics and blues shadings courtesy of Bunn’s guitar work. Two hits followed, but no further sessions, and the group resumed playing clubs together until the early 1950’s. Hayes got one last shot to cut records in 1960 but for the most part he was resigned to performing smaller club dates for the rest of his life. Hayes passed away in California in 1979, a year after Teddy Bunn. The Stardusters, in spite of their brief flurry of success, were not long remembered by the public, but their groove-based instrumentals brought together the three dominant forms of commercial black music of the 1940’s in a satisfying manner that was all too often hard to achieve. As sidemen… for Clifford Blivens.